As a child I loved to gaze at clouds, attempting to find recognizable shapes and mystical creatures in their fluffiness and awesome expansions. Often I would see the shape of a huge Canada goose and then watch it morph into a unicorn and then break apart into small wisps that danced through the sky like the waltz of Snow White’s seven dwarf friends. In many religious traditions, clouds covering the mountains or blanketing the hills and plains are often a symbol that the divine presence in all her glory is near. 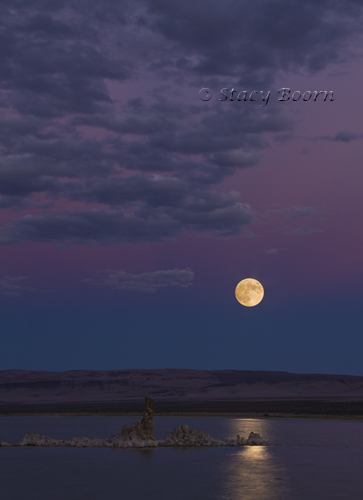 This was my recent experience in Mono County. The clouds gathered, creating a canopy that sent the message that the land beneath was sacred. As the sun shared its final rays before setting behind the Eastern Sierras, its golden and then red colors painted the clouds as the evening moved toward twilight and the moon took her prominent place. There are spectacular fall foliage hot spots in Mono County, and now is the time to see most of the Aspen Groves at peak colors. I will hopefully share images from that part of the county next week. One of the oldest lakes in the western hemisphere, Mono Lake, is hauntingly beautiful, reflecting the often snow-capped Sierra Nevada in its shimmering blue waters. An immense inland sea, the lake fills a natural basin 695 square miles in size. Because its size is threatened when the rivers, streams and snow melt are siphoned to provide water for Southern California, checks and balances have been put into place to minimize the damage. The most distinctive feature of Mono Lake is its peculiar tufa towers, mineral structures created when fresh-water springs bubble up through the alkaline waters of the lake. The lake’s salty water sustains trillions of brine shrimp and thus attracts millions of migratory birds hoping to feast on them. Spectacular young volcanoes are Mono Lake’s immediate neighbor. The craters range in age from 600 to 40,000 years old. Panum Crater is the most accessible and is the northernmost and youngest of the chain. It can be reached via a short dirt road, off Highway 120 about 3 miles east of Highway 395. 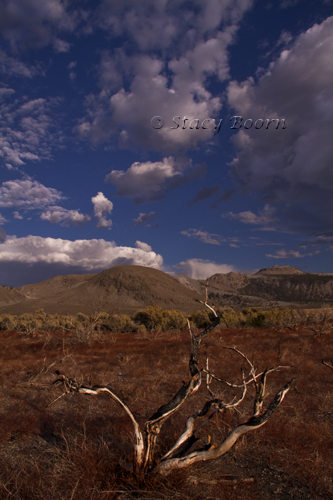 The living and skeletal remains of sage brush dot the sandy basin. Like the clouds, each bush takes on a unique shape. 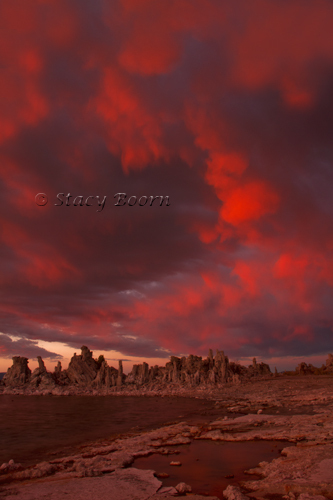 This entry was posted in Weekly 2 and tagged Clouds, Eastern Sierra, Mono County, Mono Lake, Panum Crater, Stacy Boorn, Wide Angle Photography. Bookmark the permalink.